Washer is 11.1mm in diameter with a 3.7mm hole. It is 1.0mm (18ga) thick. 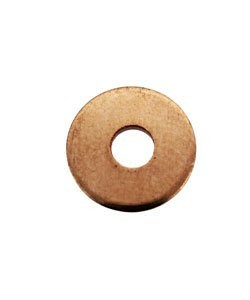 The rivets CCCU1011, CCCU1012 or CCCU1013 will fit this washer. You can use this for extra holding when you mushroom out the shank on the rivets.